We are very excited about CSA PGH 2013 artist David Bernabo's many upcoming events throughout Pittsburgh. Click here to see all the many places Bernabo will be showcasing his work in music and film. David Bernabo is a filmmaker, musician, dancer, visual artist, and writer. For the 2013 CSA Series, Bernabo created a lathe cut record, which contained a piece of spoken word and sung text, percussion, and electronics. He curates and produces work for the Ongoing Box imprint and co-curates the Lightlab Performance Series with slowdanger. Lenka Clayton's piece Qaeda, quality, question, quickly, quickly, quiet was a part of our current exhibit Mingle/Mangle, which is closing this weekend. Come join us for our Closing Event this Saturday February 24 at 1pm and get a chance to see and hear Clayton's piece. Our gallery will also be open Friday, February 23 from noon-7pm if you would like to check it out then. Lenka Clayton is an artist and founder of An Artist Residency in Motherhood. Her interdisciplinary work considers, exaggerates, and alters the accepted rules of everyday life, extending the familiar into the realms of the poetic and absurd. 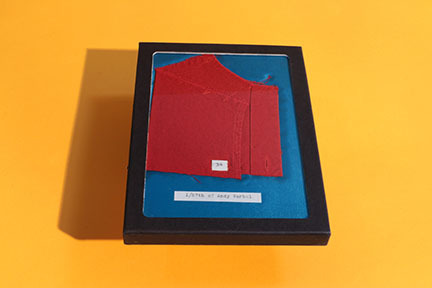 For the 2013 CSA Series, Clayton deconstructed a shirt owned by Andy Warhol. The 57 pieces were packaged and archived for each 2013 CSA shareholder. Every person received a small box including a portion of the shirt, a certificate of authenticity and a small needle and thread if the group desired to sew the shirt back together.